Only few ophthalmologists prescribe prisms now. Is it due to lack of awareness among novice? or other reasons? We don't know! However, it a fact that prisms are really useful and become the only way of salvation in many ophthalmic clinical situations, if their secrets are understood, judiciously used, and properly prescribed. This article is an attempt to revive interest in this direction. Prism is a transparent, solid, triangular refracting medium with a base and apex. Its apical angle determines the power of prism. A prism of one prism diopter power (Δ ) produces an apparent displacement of one centimeter to an object situated one meter away. Light entering the prism will deviate toward its base. However, image appears shifted to the apex, and the eye examined or treated tend to deviate toward its apex. This is how prisms function and manipulate the special location of image clinically [Figure 1]. 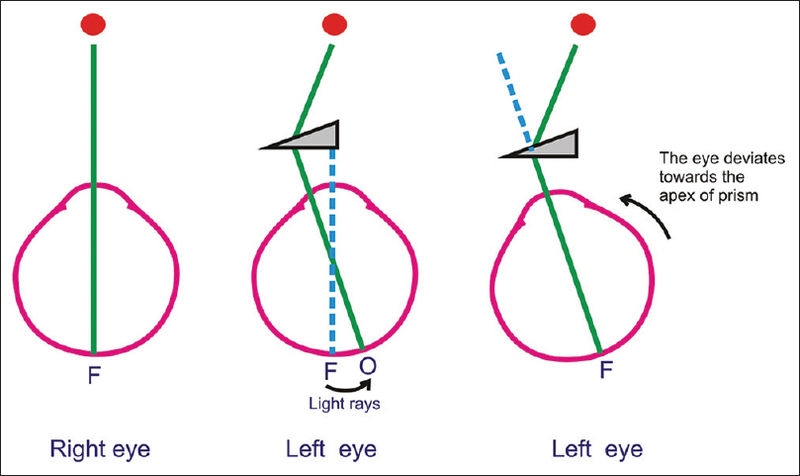 If a prism is placed before one eye, with its base directed outward, the light rays from object will be deflected outward (to the base) and fall on the retina outer to fovea. Since the light still falls on the macula of the other eye, double vision would be produced. Consequently, the eye with prism base directed outward will deviate inward so that the deflected light falls on the macula once again and binocular vision is made possible. The maximum effort which can be put in this way (the capacity to maintain fusion) is measured by the strongest prism with which diplopia is not produced. Prismatic power of even 30– 60 Δ can be overcome normally by convergence and 10– 15 Δ divergence, and 2– 4 Δ by circumvergence. 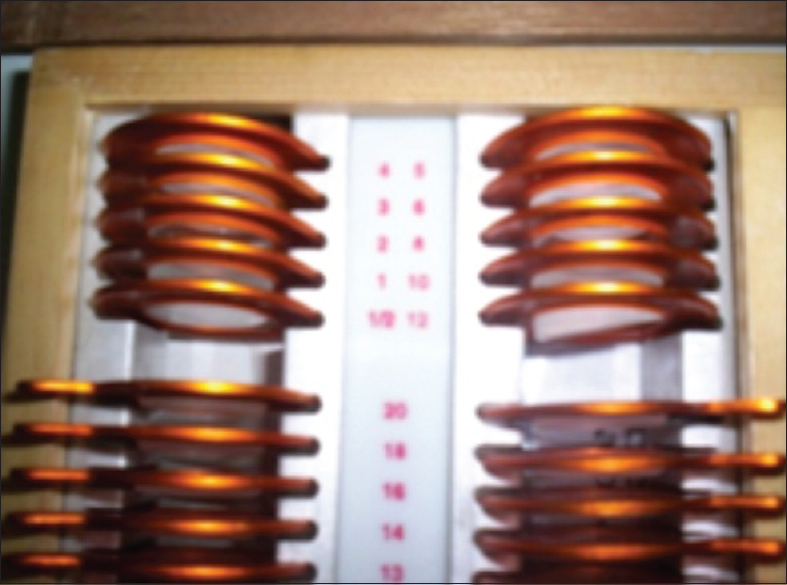 The measurements of this artificially produced diplopia (vergence power) are important in diagnosis and treatment of muscular in balance. Even though the light deviates toward the base of prism and eye deviates to the apex of prism, in practice, we denote the prisms in terms of the direction of their base - in, out, up, or down. 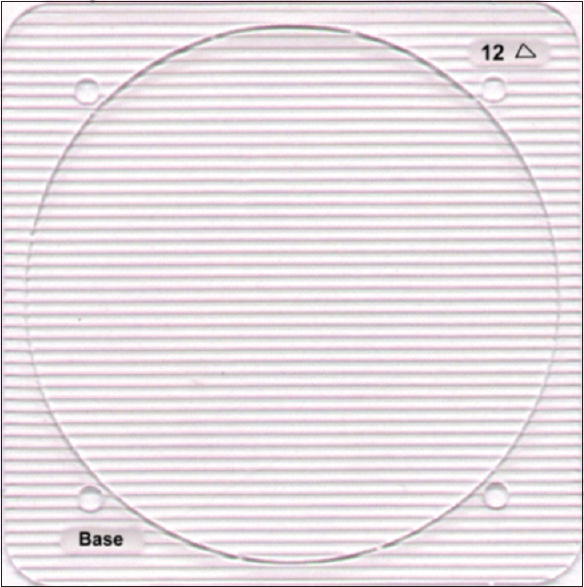 To take up an eye, base-down prism is used. 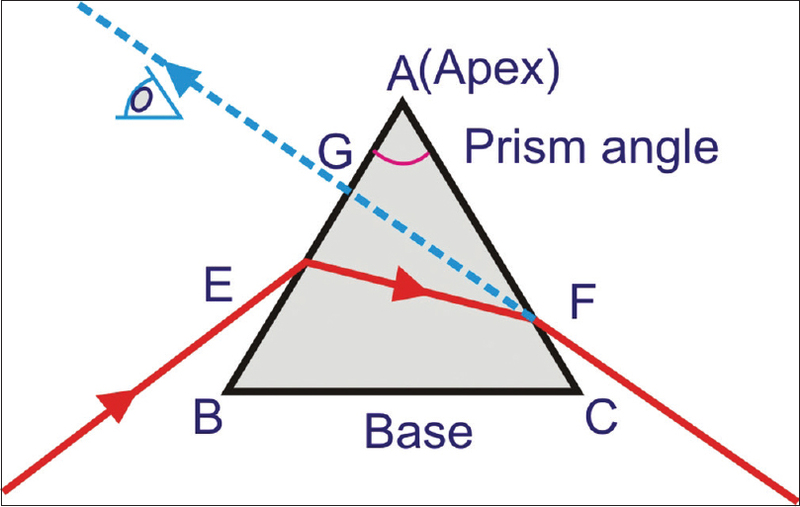 A base-out prism is an adducting prism, and a BI prism is an abducting prism [Figure 2]. 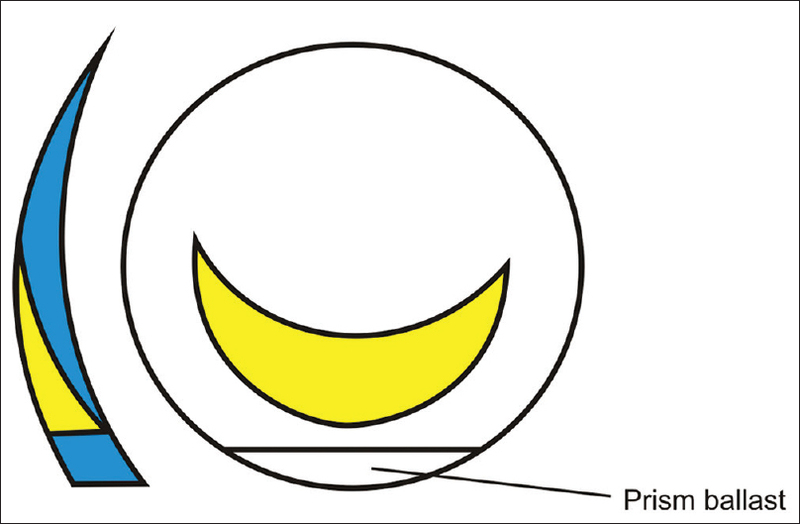 To detect the presence of a prism, hold it over an object (eg: cross line), the portion of line under the prism will appear broken and displaced towards its apex [Figure 3]. Prisms are available as loose prism in glass trial set and prism set, and also as prism bars and Fresnel prism [Figure 4], [Figure 5], [Figure 6], [Figure 7], [Figure 8], [Figure 9]. Fresnel prism - thin prisms arranged in a plastic sheet, in powers from 1 Δ to 40 Δ .
Prisms in contact lens (CL) correction. Apart from other methods of measurement of squint, the angle of deviation can be measured by placing prisms of increasing strength in front of fixing the eye with their base inward in exodeviation and base outward in esodeviations until the corneal reflection of the squinting eye becomes centered. The strength of prism necessary to achieve this is the amount of squint (Krimsky test) [Figure 10]. In modified Krimsky test, prisms are placed in front of the deviating eye. However, there is some difficulty in seeing the corneal reflex. Prisms are considered in the treatment of phorias only after correcting any precipitating causes such as general weakness, convergence insufficiency, and refractive errors. For giving exercise to weak muscles, prisms with their base toward the direction of deviation (adverse prism) are tried [Figure 12]. When the above treatments fail and also in cases of phoria developing in presbyopes, elderly persons, and poorly motivated patients, prism treatment is undertaken. Prism trial is performed using prisms in trial set, and appropriate power can be prescribed. Prisms with their base against the direction of deviation (relieving prism), are given [Figure 11]. 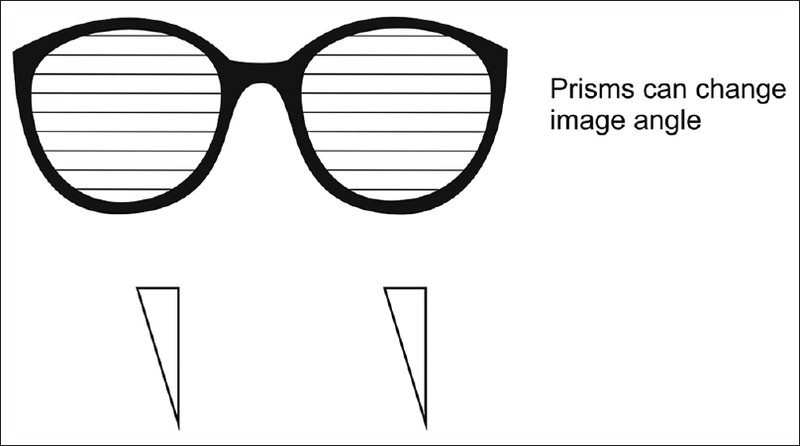 Prisms can be given as glass prisms or Fresnel prisms in spectacles. 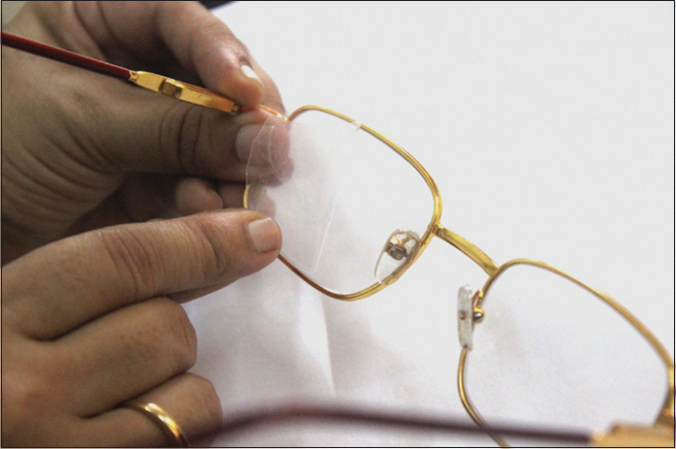 Prism adaptation – prisms are also given in spectacles, 1 month before surgery to obtain presurgical fusion of images thereby improving the outcome of surgery. By knowing how much prism will make the eyes work together, we can judge how much surgical adjustments of eye muscle is necessary. 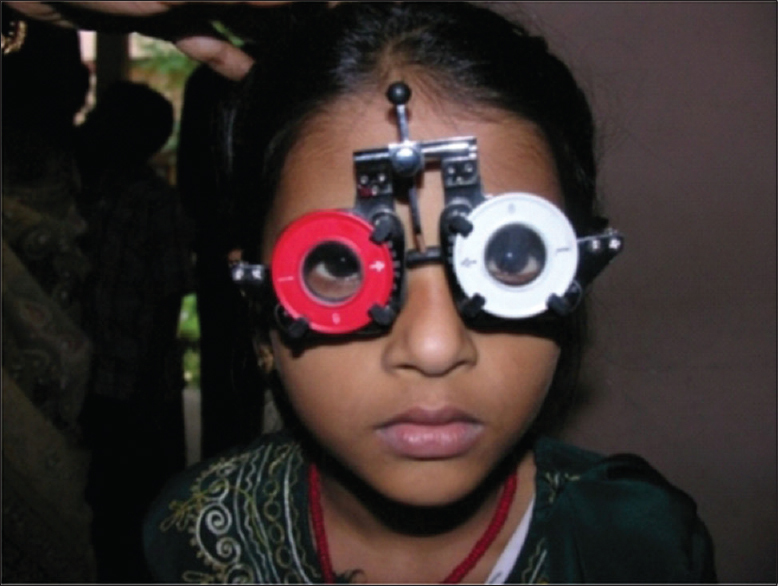 Prisms are used both in measurements of convergence (base-out prisms) and for treatment (BI prism) of convergence insufficiency; when the condition is not getting relieved by correcting the causes, refractive errors, and also by orthoptic exercises, BI prisms are prescribed for near work. 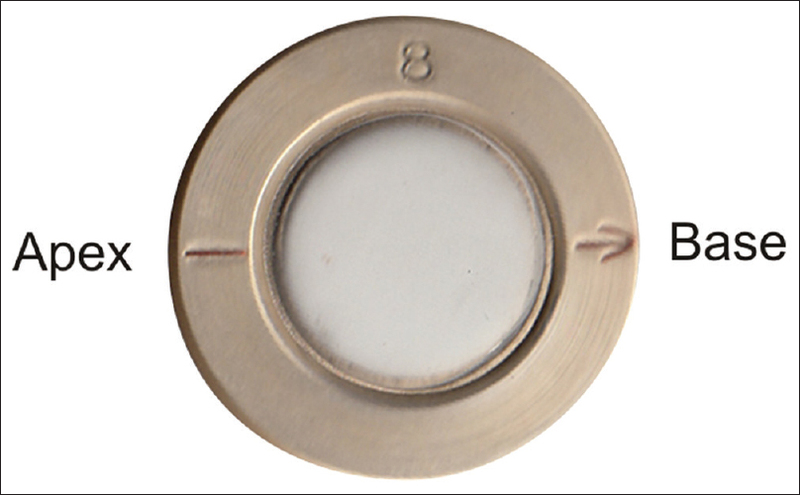 Smaller powers below 5 Δ can be attained by decentering lenses also. When divergence insufficiency is benign (without any neurological signs), it can be treated with base-out prisms in spectacles or Fresnel prisms. Base-out prisms can stimulate fusional convergence which will increase the amplitude of nystagmus, resulting in improvement in the visual acuity. Prisms also correct abnormal head turn and chin elevation in congenital nystagmus. Prisms with their base kept opposite to null zone, where the amplitude or magnitude of nystagmus is minimum (preferred direction of gaze), allow the eyes to rotate into position without large head turn. Prisms with base opposite to the preferred direction of gaze are given. For example: In a case of nystagmus, if nystagmus is minimum in the right gaze (RE-abducted and left-adducted position – null zone), eyes are in dextroversion and patient turns face toward left (face turn) to find the null point of nystagmus. If we can give BI prism in RE and base-out prism in LE (apex of both prism directed to right) will shift the image to the right or null zone, and this can enable the patient to keep face straight without turning face to the left. Compensatory chin elevation caused by null zone in dorsum version can be corrected by base-up prism. Patients with hemianopias especially homonymous hemianopia and vision in the only one eye can be helped by giving prism with its base oriented toward the blind area. This will push the eye to the seeing area providing a large view of field which was normally occupying the blind area. Prism covers only that portion of spectacle corresponding the blind area. 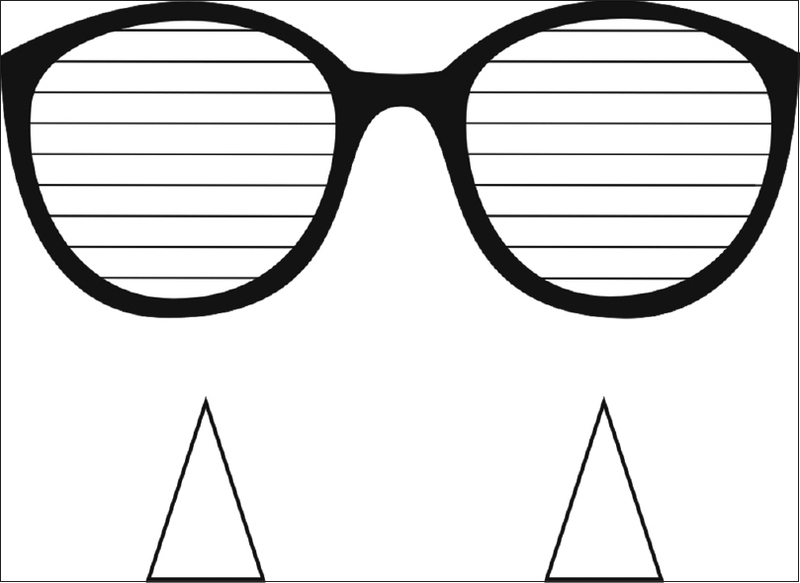 Hemianopic spectacles, incorporated with prism of about 8 Δ , with its base directed to the blind side will serve the purpose. In a patient with only seeing LE and left homonymous hemianopia can be provided with a base-out prism to see object on his left field. Prism covers the temporal portion of the left lens. Advanced glaucoma and RP patients with tubular vision have to restrict the eye movement to a limited range. Prisms help to displace peripheral blind area of visual field toward the straight ahead position to the seeing area of visual field. Small segment of Fresnel prism 5 mm from the center of pupil with its BI the same direction of restricted visual field will help the patient. Bedridden patients are forced to read or watch television in extreme downgaze. If they are provided with 15– 30 Δ , base-down prism in the form of recumbent spectacle will allow the patient to read comfortably. Prisms in Fresnel form are given temporarily till the patients recover. In paralytic strabismus, prisms are used to deplete diplopia by directing the extra image into suppression area or into retinal periphery where it can be easily ignored. 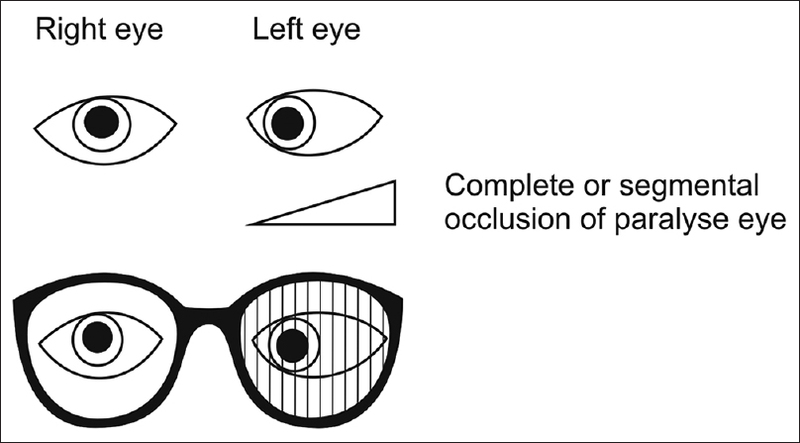 Complete occlusion or segmental occlusion in one position of gaze in single or bifocal form of 10 Δ to 20 Δ is given. Prisms are also used to stimulate the unaffected antagonistic muscle of paretic muscle thereby preventing its secondary contracture. In myasthenia gravis, multiple sclerosis, and Graves' disease, variable diplopia can be corrected using prisms. They are applied at an oblique angle to correct horizontal and vertical diplopia. Prism requirements vary with disease progression. Ankylosing spondylitis and other postural deformities with limited head movement, prism applied base up to spectacle can change the image angle [Figure 19]. In CL practice, prisms are used to stabilize the near vision portion of a segmental bifocal CL and to stabilize a toric CL, using prism ballast [Figure 20]. Fresnel prisms are now used more in prism practice as they are very thin, have only negligible weight, and more cosmetically acceptable even in high powers (30 Δ ) than conventional prisms. They are made of polyvinyl chloride [Figure 21], [Figure 22], [Figure 23]. Fresnel prisms consist of thin narrow prisms arranged in a plastic sheet. Continuous surface of a conventional prism is replaced by a series of steps. Their design is based on the principle that power of prism depend on the prism angle and not on its thickness (Augestin Fresnel). Hence, the thickness is reduced to 1 mm. 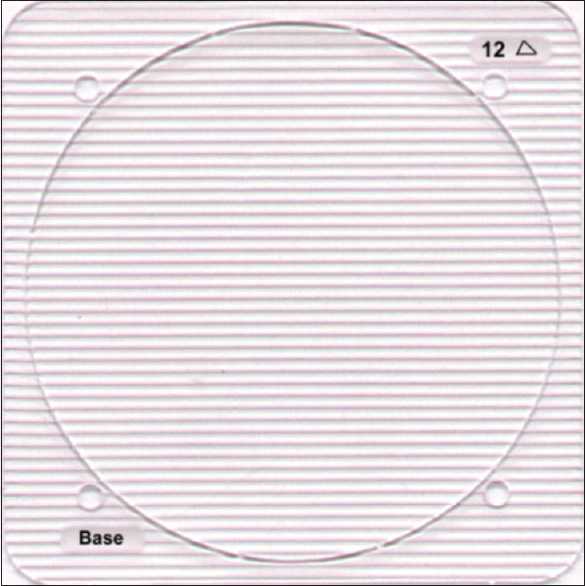 They are available in powers from 1 Δ to 40 Δ . Since Fresnel prism is thin and flexible, it can be cut into pieces and applied to the back surface of spectacle. They are preferred in most of the clinical conditions managed with prisms, especially in the treatment of squint and to relieve sudden onsight symptomatic diplopia resulting from trochlear and abducens nerve palsies, thyroid-related orbitopathy, postcataract surgery diplopia, and trauma-induced diplopia. Stavis M, Murray M, Jenkins P, Wood R, Brenham B, Jass J. Objective improvement from base-in prisms for reading discomfort associated with mini-convergence insufficiency type exophoria in school children. Binocul Vis Strabismus Q 2002;17:135-42. 3M Press-on optics-distributed by Peral optics, 30th cross, 4th block, Jay Nagar, Bangalore 560011. Roodhooft J, Van Rens G. A prism is a useful tool in the treatment of vertical diplopia. Bull Soc Belge Ophtalmol. 1998;268:215-22. Flanders M, Sarkis N. Fresnel membrane prisms: Clinical experience. Can J Ophthalmol 1999;34:335-40. Wylie J, Henderson M, Doyle M, Hickey-Dwyer M. Persistent binocular diplopia following cataract surgery: Aetiology and management. Eye (Lond) 1994;8(Pt 5):543-6.